Well we�ve seen them in the latest scrapbooking mags and I must admit they are so fun to alter. That�s right I�m talking about paint tins. Brand new empty paint tins. What once held paint, can now hold anything you desire. From Easter eggs for the kids on Easter morning to a special gift to say I love you and anything in between, these paint tins are great, versatile and so much fun to play with. Fill them up or keep them empty - the choices are incredible. All you need is a paint tin... or 2 or 3 or 4... your endless supply of scrapbooking materials, time and your imagination. Most paint stores sell new and unused paint tins and they are not that expensive. When you do purchase them make sure the handles come with them as they can be kept separate from the paint cans and you may need to ask for them. I was able to pick mine up for $4.95 per 4 litre tin. You can get white or the plain metal ones, which I thought was pretty good. I preferred to use the 4 litre plain metal ones for the tins I have altered here. They are a great size and there is little trimming down when it comes to covering them with your papers. Of course you may chose to use smaller or bigger ones if you so desire. 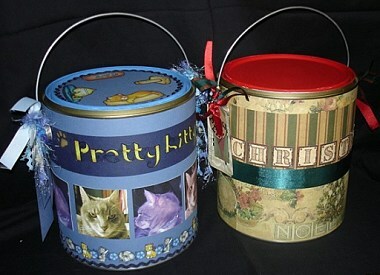 Gather your supplies, papers, trims, ribbons etc, that you wish to use on your tin. Trim your paper to the appropriate size. I have used 2 different papers on both tins. Remember that you will need to trim 2 identical pieces to go all the way round the paint tin. You also need to leave a little extra for overlap on the sides of the tin. Carefully trim the paper away from the handle circles so the paper fits snug to the tin. I have used double-sided tape to adhere the paper to the tin as it is stronger. Decorate your tins with any ribbons, fabrics, fibres, stickers such as Bo Bunny's Pretty Kitty stickers, die-cuts, etc with double-sided tape as it is stronger. You may also choose to use photos as I have on the �Pretty Kitty� paint tin. I have edited, played and had fun changing these in a photo software program to blend in with the colour scheme I have chosen for this tin. Add ribbons, fibres, and handmade tags to the paint tin handles. You can tie a few ribbons to each side of the handle or you may like to tie ribbons, fabric or fibres to the entire handle. Don�t forget the lids. If you choose to paint them, I suggest that you rough the surface slightly with sandpaper so the paint has something to adhere to. Alternatively you may wish to use a sealer. Keeping this in mind, the Jo Sonya range of acrylic paints are made with a sealer in them. Clean the lid then apply paint, allowing for drying time. You may use two coats if you like depending on the final look you wish to achieve. If you choose to cover the lid with paper, trim paper to fit snug inside the lid. To achieve this, place paper on lid and gently run your fingers round the edge then cut to size. Trim with ricrac or ribbon using double-sided tape or a Xyron Create a Sticker machine. Decorate with any extra embellishments. That�s it�.fun and simple. You can do anything with them and they make great gifts. So go on and get creative.